One of the key things that investors would ask entrepreneurs is a financial model. Typically, as a company moves from seed to series A and B, the importance of the financial model to the investors increases. It is my strong personal belief that a financial model is a must have for any venture. First and foremost for the management team itself. And secondly for sharing with potential investors. It depicts the way the management thinks about the business and it can reveal the flows of the business model. Many people believe that building a financial model is not within the core skills an entrepreneur must possess. I disagree. Understanding the basic principles of finance is of outmost importance if you want to lead a business. And being able to put this in a simple, clean way in an Excel file is a matter of always delivering good quality. Lets forget about financial models for a minute and think about computer code. How often are you frustrated when browsing at someone else’s code – looking like spaghetti code? Or a code without any comments, with bad indentation and extremely large functions? Good developers are writing code that can be easily extended by another developer, is pleasant to read and has minimal dependencies. As a growth stage investor, I receive and review quite a few financial models each month. Quite often I am also frustrated when browsing at these models. Think of a financial model as a very dummy program. As such, it also has some principles for keeping it clean. A messy financial model is a signal for either a messy entrepreneur or someone who does not care enough. Below you can find some best practices of creating a good financial model. See it as the equivalent of clean computer code to financials. 1. Before you actually start building the model, spend some time and think through the logic of the model’s structure. It should be simple and easy to follow. 2. Create an instructions tab. Show the model structure in a simple graph. Define abbreviations and special terms used in the model. 3. Don’t use too many tabs. Avoid using hidden tabs, as it can be quite confusing for the reader. I would suggest trying to keep the model under 10 tabs. Give every tab a sensible naming. 4. Separate the model inputs and assumptions from the model outputs. This makes things easier to follow and understand. ​As every business is different from each other, every financial model is also different. There is no universal solution. Nevertheless, I would suggest working alongside this proposed structure. 5. ​ NEVER use hard coded numbers in formulas. I cannot even emphasize how important this is. Having hard coded numbers in formulas makes a model hard to follow, but even more importantly, it makes it vulnerable to mistakes. 6. Use color coding in cells and tabs. Especially important is to clearly indicate the input cells by a visible color coding. An example would be to have all hard coded inputs with blue font in a specific background. 7. Be consistent. Consistency is important, both in format and in the formulas. 8. Make calculations easy to follow. Don’t use huge formulas, inheriting data from many different cells. Instead bring the data in an easy to follow way in the tab you need to use them. 9. The main output of the financial model should definitely be the financial statements and statistics. In order to make your model stand out I would suggest to also include the key KPIs. This is important, not only for your investors, but for the entrepreneurs themselves. Depending on the business show MRR, churn or any relevant KPI. 10. Include a sensitivity analysis. 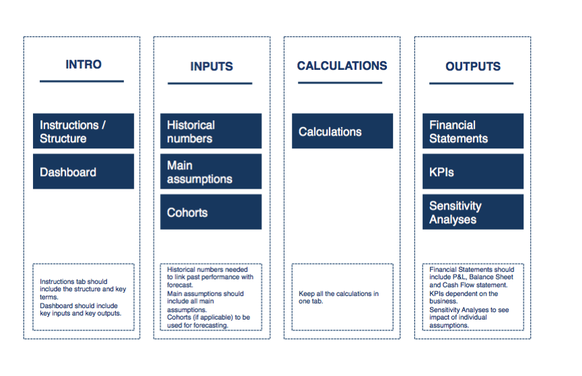 See how changing key assumptions impacts the model’s outputs. Building good financial models is something investment bankers do very well. Financial analysts learn about these principles on day 1. Thus, you can always engage an advisor to build the model for you. But I believe that especially for early stage businesses, the process of building the model can be very educating for an entrepreneur. But as you can see, it doesn’t have to be that hard. All of the above mentioned tips are nothing more than the equivalent of clean code for a financial model. 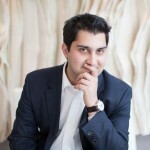 This blog was written by Nick Kalliagkopoulos, VC at Prime Ventures. It originally appeared on the VEECEE blog. Understanding reasons for VC rejections – Why are you different? Thanks a lot for the trips and the good examples. Will be very useful for my start up.